Letitia Michelle Wright is a Guyanese-born British actress. 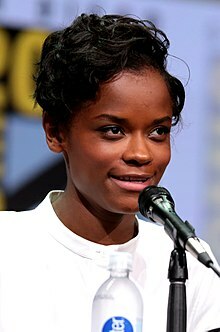 Beginning her professional career in 2011, she has played roles in several British TV series, including Top Boy, Coming Up, Chasing Shadows, Humans, the Doctor Who episode "Face the Raven" and the Black Mirror episode "Black Museum"; for the latter she received a Primetime Emmy Award nomination for Outstanding Supporting Actress in a Limited Series or Movie. The British Academy of Film and Television Arts named Wright among the 2015 group of BAFTA Breakthrough Brits for her role in the award-winning film Urban Hymn. In 2018, she achieved global recognition with her portrayal of Shuri in the Marvel Cinematic Universe films Black Panther and Avengers: Infinity War, both of which stand amongst the highest-grossing films of all time. In 2019, she received the BAFTA Rising Star Award. The British Academy of Film and Television Arts named Wright among the 2015 group of BAFTA Breakthrough Brits for her role in the award-winning film Urban Hymn. In 2018, she achieved global recognition with her portrayal of Shuri in the Marvel Cinematic Universe films Black Panther and Avengers: Infinity War, both of which stand amongst the highest-grossing films of all time. In 2019, she received the BAFTA Rising Star Award. Wright was born in Georgetown, Guyana. Her family moved to London when she was seven years old and she attended school there. Having been brought up in Tottenham and attending Duke's Aldridge Academy, she has stated, "I'll always be a north London girl." Wright performed in school plays as a child, but credits her desire to be a professional actress to the 2006 film Akeelah and the Bee. She found Keke Palmer's performance inspiring, remarking that the role "resonated. It's one of the reasons why I'm here". She attended the Identity School of Acting, enrolling at the age of 16. She appeared in two episodes of Holby City and Top Boy in 2011. She had a small role in My Brother the Devil in 2012, where she was recognized by Screen International as one of its 2012 Stars of Tomorrow. Michael Caton-Jones cast Wright in her first leading role in Urban Hymn (2015), which brought her to the attention of Hollywood. The same year, she appeared in an episode of Doctor Who, and the following year, she began a recurring role as Renie on Humans. During this time, she also appeared in the play Eclipsed on the West End. In 2017, Wright starred in the Black Mirror episode "Black Museum"; her performance earned her a Primetime Emmy Award nomination for Outstanding Supporting Actress in a Limited Series or Movie. Wright co-starred in the 2018 film Black Panther, playing the role of Shuri, King T'Challa's sister and princess of Wakanda. Part of the Marvel Cinematic Universe, the film also starred Chadwick Boseman, Michael B. Jordan, Lupita Nyong'o, and Danai Gurira. She reprised the role in Avengers: Infinity War, which was released later that year. Also in 2018, Wright appeared as Reb in Steven Spielberg's film adaptation of the 2011 science-fiction novel Ready Player One. Wright features as one of the cameos in Drake's music video for "Nice for What". In 2019, Wright won the BAFTA Rising Star Award. Wright has been vocal about her struggles with depression. In 2018, she told Vanity Fair that when she first experienced depression at the age of 20, she "was in the dark going through so many bad things". Wright credits her faith for helping her overcome her depression, which she discovered after attending a London actors' Bible study meeting. To focus on her recovery and her faith, she declined film roles. She later explained she "needed to take a break from acting" and "went on a journey to discover my relationship with God, and I became a Christian." 2011 Holby City Ellie Maynard Episodes: "Tunnel Vision" and "Crossing the Line"
2013 Coming Up Hannah Episode: "Big Girl"
Chasing Shadows Taylor Davis Episode: "Only Connect"
Doctor Who Anahson Episode: "Face the Raven"
2017 Black Mirror Nish Episode: "Black Museum"
↑ "BAFTA and Burberry Reveal 2015 Breakthrough Brits". BAFTA.org. Retrieved 22 February 2018. ↑ Aron, Isabelle (8 February 2018), "Black Panther' star Letitia Wright: 'I’ll always be a north London girl’. Time Out. Retrieved 22 February 2018. 1 2 Rittman, Alex (8 November 2018). "Letitia Wright: Secret Donald Glover Project, Spelling Bees and More Things Left Out of Hollywood Reporter's Cover Story". The Hollywood Reporter. Retrieved 6 March 2019. 1 2 "Black Panther's Letitia Wright gets Bafta nod". BBC. 3 January 2019. Retrieved 6 March 2019. 1 2 3 4 5 Rittman, Alex (7 November 2018). "'Black Panther' Breakout Letitia Wright on How Faith Rescued Her From a "Very Dark Place"". The Hollywood Reporter. Retrieved 6 March 2019. ↑ Wiggan, Dylan (15 April 2015). "Rising star Letitia Wright 'Black Actors need more positive roles'". House of Black. Retrieved 16 February 2017. 1 2 3 4 5 Robinson, Joanna (7 February 2019). "Black Panther Breakout Letitia Wright Smashes Disney Princess Expectations". Vanity Fair. Retrieved 6 March 2019. ↑ "Who is Letitia Wright? The 'Black Panther' breakout star is just getting started". South China Morning Post. 23 February 2018. Retrieved 27 February 2018. ↑ Pape, Stefan (26 September 2016). "Exclusive: Letitia Wright on Urban Hymn and working with Spielberg on Ready Player One". heyuguys. Retrieved 16 February 2017. ↑ Kroll, Justin (20 October 2016). "'Black Panther' Adds 'Ready Player One' Actress Letitia Wright (EXCLUSIVE)". Variety. Archived from the original on 21 October 2016. Retrieved 20 October 2016. ↑ Childs, Joi (16 February 2018). "'Black Panther': How Letitia Wright Became a Marvel Breakout". The Hollywood Reporter. Retrieved 27 February 2018. ↑ Carr, Mary Kate (16 February 2018), "5 things to know about Black Panther breakout star Letitia Wright", EW. Retrieved 22 February 2018. ↑ Maicki, Salvatore (7 April 2018). "A breakdown of all the cameos in Drake's 'Nice For What' video". The FADER. Retrieved 7 April 2018. 1 2 "Baftas 2019: The Favourite takes home seven awards". BBC. 10 February 2019. Retrieved 6 March 2019. ↑ "'Black Panther' Breakout Star Letitia Wright Shares How Christianity Changed Her Life". RELEVANT Magazine. 21 February 2018. Retrieved 3 March 2018. ↑ McNarry, Dave (15 March 2018). "'Black Panther,' 'Walking Dead' Rule Saturn Awards Nominations". Variety. Retrieved 6 March 2019. 1 2 Ramos, Dino-Ray (18 June 2018). "MTV Movie & TV Awards Winners: 'Black Panther', 'Stranger Things' Among Top Honorees – Full List". Deadline Hollywood. Retrieved 6 March 2019. 1 2 "Teen Choice Awards: Winners List". The Hollywood Reporter. 12 August 2018. Retrieved 6 March 2019. 1 2 McNary, Dave (13 February 2019). "'Black Panther' Leads NAACP Image Awards Nominations". Variety. Retrieved 6 March 2019. ↑ Tapley, Kristopher; Otterson, Joe (27 January 2019). "SAG Awards: The Biggest Snubs and Surprises". Variety. Retrieved 6 March 2019. Wikimedia Commons has media related to Letitia Wright.